There are few situations in life that are more stressful than finding out your car has a dead battery. Especially if you don’t have any jumper cables or can’t find anyone willing to give you a jump start. If your car has an automatic transmission, your only options would be to call a friend or a tow truck. 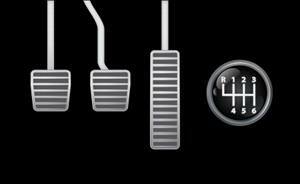 However, if you have a manual transmission, consider: using your clutch to push start your car. Push starting is a method for starting a vehicle with a manual transmission. It can’t be done if you have an automatic transmission because it requires a clutch. If you own a stick-shift vehicle, it’s a good idea to learn the push start method in advance because it could really help you out one day. There are a few possible reasons why your car won’t start, and before attempting the push-starting method, you will want to make sure that your car isn’t failing to start because the starter itself is broken. If it is the starter, the push-starting method will not work. To determine if this is the case, listen to the sound your engine makes when you attempt to start the car. If you hear a clicking noise, a dead or dying battery is probably the issue. If you hear a roaring sound or some other noise, it could be something else. For the push-starting method to work, you will obviously need someone to push your car. Ideally, you will have two or even three people, but it can be done with only one if you have a small car. Before you start the process, you will want to make sure to turn off anything that might drain power from your car. This includes the heater, the air conditioner, the radio, the lights and the windshield wipers. Once you accomplish this, put the key in the ignition and turn it to the start position. When you’re ready to begin, put the car into second gear and push the clutch all the way in. Release your brakes, and after you’ve made sure the road is clear, have your helpers begin pushing your car. The aim is to get the car moving as fast as possible, so if you can, it’s best to do this while going downhill. Of course, this isn’t always possible, so just have your helpers do their very best to get you moving. Also, be extra cautious because your power brakes will not work without the car running. Once the car is moving, release the clutch and press down on the gas pedal. As long as you did everything correctly and a dead battery was truly the problem, your engine should start. At this point, you will need to drive the car for a few minutes to charge the battery before stopping again. If your helpers were also your passengers, you might want to take a spin around the block a few times before stopping and picking them up. From here, your only goal should be to drive to an auto-parts dealer and have a new battery installed. Depending on the problem, driving around for a while might charge your battery to some degree, but if it died once, it will probably die again soon. Don’t wait to get it replaced.